Global Desi recently held their AW’14 collection preview called ‘MiMaMo‘ at Anita Dongre style attic and I was there to get a first hand sneak peak. I also styled some of my favourite pieces together from the collection. With this collection Global Desi celebrates the ancient art of Madhubani fused with kaleidoscopic elements of mosaic. Enhanced with symbolic images such as the lotus plant, moving fish, birds, turtle or sun gods that symbolise well-being, luck, prosperity and have been an intrinsic feature of Madhubani art- this boho-chic collection highlights the innate beauty of Indian heritage and the vibrancy of medieval art. They are known for the ethnic fusion clothes and this time around Mithali, Madhubani and Mosaic are the prime inspiration behind their AW collection, hence the name ‘MiMaMo’. 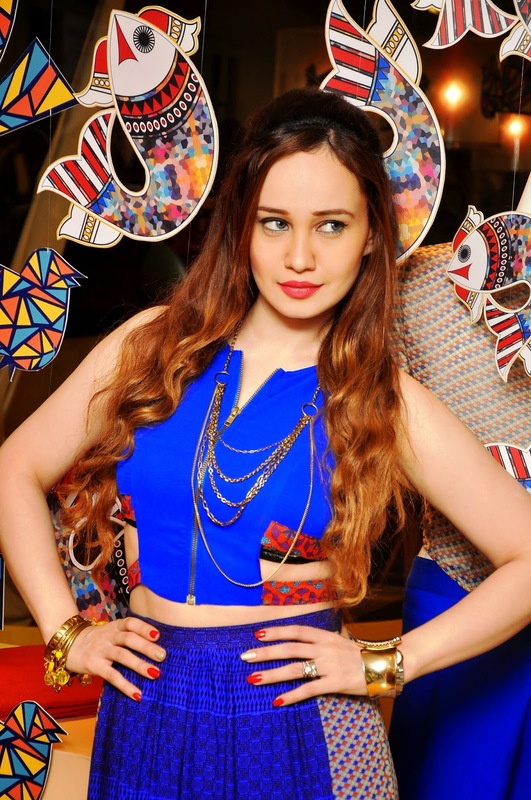 I absolutely loved the mix of stylish cuts, bold prints and vibrant hues. The collection boasts of loads of maxi dresses, jumpsuits, pallazzo pants, tunics, jackets,long skirts and shirts, all fit for the upcoming winters. 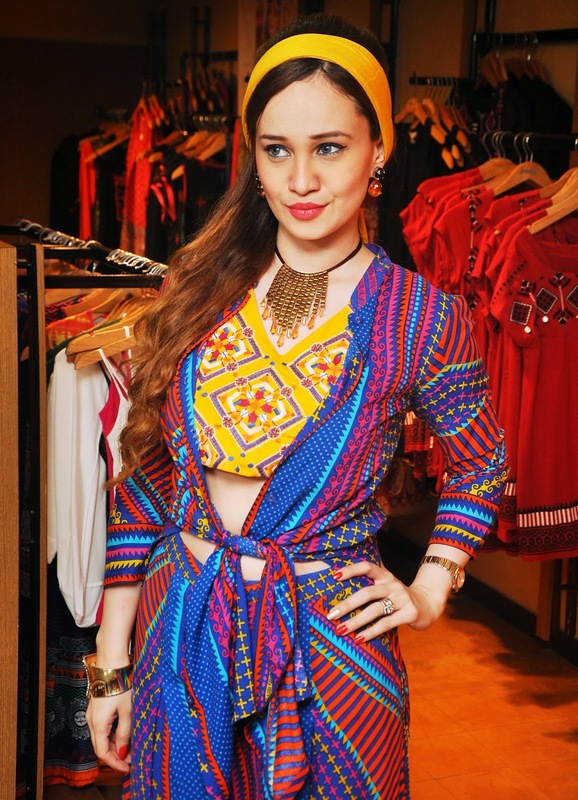 I absolutely love their collection, specially the crop tops,maxi skirts and dresses.The bold use of colors and motif prints make it a perfect ethnic fusion collection. For my first look I styled this cobalt blue zipper crop top with orange band cut-outs with this MiMaMo printed .maxi skirt with a side slits. I accessorised with this multi-layered brass-look necklace. For my second look I styled these Mimamo print culottes with a matching shirt, worn as an open tie-up shirt paired with this yellow embroidered crop top and accessorized with a yellow scarf worn as a head band and a brass look necklace with orange droplets & matching earrings. I loved both these fun & quirky boho-chic looks I put together from the MiMaMo collection. Loving that bright blue color! You look amazing and beautiful. for fashion inspiration giveaways and more!! i love the crop in the first look and the maxi too. I’m obsessed with your skirt – so pretty and unique! I love the accessories you chose too. You look amazing. Love both the outfits. The skirt in the first outfit is stunning!